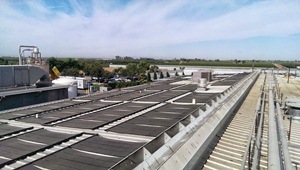 Solar array at Cargill’s Fresno beef processing plant. The plant added solar energy to pre-heat water used throughout the plant for food safety and sanitation purposes. FRESNO, Calif. – September 23, 2013 – Cargill and TEVA Energy, LLC commissioned the largest solar energy system at a meat processing facility in California. Cargill’s Fresno beef processing plant has added solar energy to pre-heat water used throughout the plant for food safety and sanitation purposes, reducing its fossil fuel energy requirements, thereby reducing the facility’s environmental footprint. This solar energy recovery system, coupled with an existing methane recovery system installed several years ago, reinforces the facility’s commitment to continually evaluating and incorporating renewable energy. 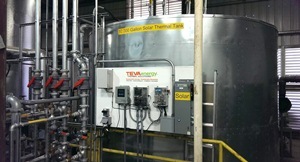 TEVA solar thermal tank installed at Cargill's Fresno beef processing plant. System performance is being monitored in real time by TEVA, Cargill and the state’s California Solar Initiative program through remote metering, as well as on-site monitoring equipment. “TEVA Energy’s design and installation performance was stellar and they worked closely with our team, always going the extra mile throughout the process,” said Ashley Apple, technical safety facilitator at the Cargill facility. “The results speak for themselves, with strong performance numbers and praise from county and state inspectors.” The state’s California Solar Initiative – Thermal inspector, Thomas Scott, added: “TEVA Energy has raised the bar with this solar installation at Cargill." TEVA and its financier, Skyline Innovations, Inc., installed and own the solar system, eliminating the capital investment Cargill would otherwise need to make to gain the benefits from solar water heating. To finance the project, TEVA and Skyline aggregate incentives with the income stream from the solar energy sold to Cargill at rates below their natural gas rates. Cargill’s Fresno beef processing facility is one of the largest of its type in California, producing more than 124,000 tons of beef products annually and employing 975 Californians. Altamonte, Fla.-based TEVA Energy provide cost-effective solar water heating technologies that enable it to provide renewable energy to commercial and industrial facilities at rates below equivalent fossil fuel energy rates. At its own expense, TEVA designs, builds and maintains its systems on the client’s site, “greening” their facility. TEVA services large industrial and commercial facilities. More information is available at: www.TEVAenergy.com.